The Mississippi River is North America's longest and largest river in terms of discharge , and the fifth largest discharge river worldwide, at an average of 17,330 cubic meters per second (811,530 cubic feet per second). The Mississippi flows 3,763 kilometers (2,333 miles) from Lake Itasca in northern Minnesota to its delta in southern Louisiana (see map). The Mississippi River Basin encompasses more than 40 percent of the U.S. land area. Its diverse features, rich history, and heavy human demands challenge water resource managers who must balance complex issues. The Mississippi River drainage basin is the world's second largest, draining 4.76 million square kilometers (1.83 million square miles), including tributaries from thirty-two U.S. states and two Canadian provinces. The Mississippi River watershed encompasses 40 percent of the contiguous United States. Major tributaries include the Missouri, Ohio, Arkansas–Red–White, and Tennessee Rivers. The Mississippi River is vital to the people of the basin. Over 18 million people rely on the Mississippi for water supply. Communities up and down the Mississippi use the river to discharge industrial and municipal wastes (as permitted by the U. S. Environmental Protection Agency). Commercial navigation on the Mississippi River allows Midwestern farmers to ship grains to world markets, with over 60 percent of U.S. grain exports shipped via the Mississippi. The river generates close to $2 million annually from commercial fishing and over $1 billion from Upper Mississippi River recreation alone. Owing to the environmental diversity of the watershed, the river system has developed extraordinary species richness. The river provides habitat for 241 fish species and 37 mussel species, while its bluffs and bottomlands support 45 amphibious and reptile species and 50 mammal species. The floodplain includes the largest continuous system of wetlands in North America, which are used by up to 40 percent of North America's waterfowl and wading birds. The Mississippi River has undergone tremendous natural change. It has carried the meltwater of continental ice sheets in the recent geologic past; it has carved and filled valleys; and it has responded to floods and droughts. However, one of the greatest changes to the Mississippi River is neither natural nor ancient—it is the engineering of the river for commercial navigation and flood control. The history of commercial navigation began in the 1830s, with the U.S. Army Corps of Engineers removing rock from the Des Moines (Iowa) and Rock Island (Illinois) rapids. At this time, the river still retained much of its natural anastomotic character: that is, its waters naturally split and rejoined in countless side channels, producing a dynamic mosaic of islands, floodplains, and waters. Later in the nineteenth century, steamboat traffic increased and the U.S. Congress authorized a series of channel improvements, beginning in 1866 with the establishment of a 4-foot-deep channel. Further regional growth prompted channel deepening to 4.5 feet in 1878, 6 feet in 1907, and 9 feet in 1930. The 9-foot channel project began a new era of river development, entailing construction of twenty-six locks and dams from Minneapolis (Minnesota) to St. Louis (Missouri). The U.S. Army Corps of Engineers maintains the 9-foot channel and the U.S. Coast Guard monitors watercraft safety. Individuals began building agricultural levees before the Civil War, with organized levee districts developing soon after the war. By 1914, fifty-two levee and drainage districts had been established between Rock Island, Illinois and Cape Girardeau, Missouri, laying the foundation for flood control far into the future. In 1917, Congress passed the country's first flood control act, authorizing the Corps of Engineers to work on levees from Illinois to Louisiana. After the devastating flood of 1927, these efforts were reinforced in the 1928 Flood Control Act. In the 1920s, environmentalists began to warn that river management for navigation and agriculture was threatening river ecology. In 1924, Congress established the Upper Mississippi River Wildlife and Fish Refuge, which grew to include 78,900 hectares (195,000 acres). The U.S. Fish and Wildlife Service manages this refuge and many other refuges within the watershed. While the lessons of the past provide insights into the Mighty Mississippi, river managers are constantly faced with new challenges. The many perspectives on the values of the Mississippi River and how it should be managed illustrate the significance of this important resource. Like all rivers, the Mississippi naturally changes course over time. As lower reaches of the river flow through the delta, sediment deposition slowly reduces the river's slope until the channel breaches (breaks) its banks and establishes a shorter, steeper route to the Gulf of Mexico. In recent decades, the Mississippi River has been drawn toward the Atchafalaya River, seeking a more direct route to the Gulf (see map). Because of the port facilities and extensive industrial corridor in southern Louisiana, a shift of the river channel to this new route would be economically devastating. Thus the Corps of Engineers wages a continuous battle against the forces of nature to maintain the existing channel. Although severely damaged in the flood of 1973, the "Old River Control Structure" continues to divert a small percentage of the flow into the Atchafalaya River, yet most of the discharge continues to the Gulf via the Mississippi. Sandbags afford only minor protection from the Mississippi River's flood waters. 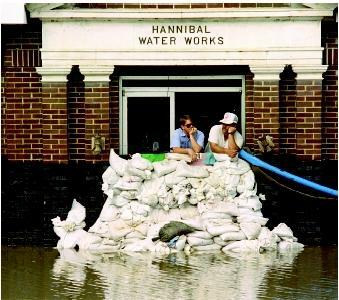 Buildings and infrastructure located in the floodplain (such as this water-supply pumping station in Hannibal, Missouri) are vulnerable to direct damage from flowing water, debris, and saturated soils, as well as indirect damage from contamination. For shallow unconfined aquifers, floodwaters may seep directly down to the water table. In some places, the flood magnitude was statistically described as one that is expected to recur only an average of once every 500 years. This extreme event reminded residents of their vulnerability and generated change in the philosophy of flood protection. Some entire communities—such as Valmeyer, Illinois—were moved out of the floodplain to higher ground nearby. Certain floodplain lands once occupied by farms, houses and other structures were restored to natural uses as wetlands and wildlife refuges. But despite these preventive measures and the known risks of continued floodplain development, such development nonetheless continues in many areas, where future floods will once again cause great economic damages and personal hardship. Perhaps the greatest concern of the late twentieth and early twenty-first centuries focuses on the effects of the Mississippi River on the Gulf of Mexico. Extensive agriculture throughout the watershed is responsible for elevated river concentrations of nutrients such as nitrogen and phosphorus. The Mississippi provides 90 percent of the fresh water flowing into the Gulf, and the nutrient load it delivers has generated a serious problem: namely, a critical lack of dissolved oxygen in thousands of square kilometers of Gulf waters known as the "Dead Zone." Given the importance of Gulf marine life (for example, a multi-million dollar shrimp fishery), this hypoxia problem is receiving a great deal of attention. Proposed solutions include improved nutrient management on farms and reconstruction of riparian forests and wetlands capable of removing excess nutrients. SEE ALSO Algal Blooms in Fresh Waters ; Floodplain Management ; Pollution by Invasive Species ; River Basin Planning ; Rivers, Major World . Changnon, Stanley A., ed. The Great Flood of 1993: Causes, Impacts, and Responses. Boulder, CO: Westview Press, 1996. Galat, David L., and Ann G. Frazier, eds. "Overview of River-Floodplain Ecology in the Upper Mississippi River Basin," Vol. 3. Kelmelis, John A., ed. Science for Floodplain Management into the 21st Century. Washington, D.C.: U. S. Government Printing Office, 1996. Scientific Assessment and Strategy Team. "Science for Floodplain Management into the 21st Century." Report of the Interagency Floodplain Management Review Committee to the Administration Floodplain Management Taskforce. Washington, D.C.: U. S. Government Printing Office, 1994. Theiling, Charles H. "Habitat Rehabilitation on the Upper Mississippi River." Regulated Rivers: Research and Management 11 (1995):227–238. Wiener, James G., Richard V. Anderson, and David R. McConnville, eds. Contaminants in the Upper Mississippi River: Proceedings of the 15th annual meeting of the Mississippi River Research Consortium. Boston, MA: Butterworth Publishers, 1984. 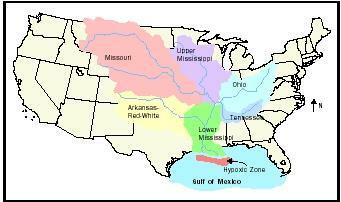 Mississippi River Basin. Office of Water, U.S. Environmental Protection Agency. <http://www.epa.gov/msbasin/index.htm> . In 1991, the zebra mussel, a species not indigenous to the Mississippi River Basin, moved from Lake Michigan into the Illinois River. This rapidly reproducing, invasive mollusk is now found throughout the Mississippi River and its major tributaries. In addition to increasing operating costs of river infrastructure, the mussel threatens the ecological diversity of native river species. The great flood of 1993 actually had a total of $15 billion in damages. I know this because it says $15 billion on noaa.gov.